Kirsten Raymonde will never forget the night Arthur Leander, the famous Hollywood actor, had a heart attack on stage during a production of King Lear. That was the night when a devastating flu pandemic arrived in the city, and within weeks, civilization as we know it came to an end. Twenty years later, Kirsten moves between the settlements of the altered world with a small troupe of actors and musicians. They call themselves The Travelling Symphony. Mandel is an able and exuberant story­teller, and many readers will be won over by her nimble interweaving of her characters’ lives and fates. Two other survivors whose stories are deftly tied in are Arthur’s closest male friend, who manages to find purpose in his role as an elder resident of the airport settlement, and a paramedic, first seen performing CPR on the actor on the night of his death, who yearns to make amends for a previous career as a cheap paparazzo (whose prey happened to include Arthur and Miranda). “Station Eleven” is as much a mystery as it is a post-apocalyptic tale, and Mandel is especially good at planting clues and raising the kind of plot-thickening questions that keep the reader turning pages. A suggestion that I hear quite often is that our interest in post-apocalyptic fiction is a natural expression of the anxiety we feel. We always seem to think the world's ending. It's some sort of combination of pessimism or narcissism that — it's almost as though we want to believe or living at the climax of the story. Someone suggested to me that it has to do with economic inequality. That we secretly desire a situation in which this entire apparatus is blown up and we all start over again on perfect equal footing. The theory that I found the most interesting was suggested to me by a bookseller in England last year: she thought perhaps our interest in these futuristic narratives had to do with the fact that there are no more frontiers. You know, it's no longer possible to set out as a pioneer and stake a claim and start a new life. Now that that's all mapped and charted out and there are no more frontiers — that's left us with a certain restlessness, that I suppose gets channeled into our interest in this futuristic, speculative fiction. 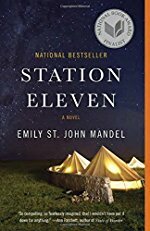 LM: Station Eleven paints a much more hopeful picture of humanity than many other post-apocalyptic works such as The Road or The Walking Dead. How conscious were you of trying to counter the narrative that humans must descend into pure violence, horror, and brutality when disaster strikes? ESJM: It’s not that I don’t think that humans would descend into pure violence and horror, it’s more that I think we wouldn’t stay there forever, because mayhem isn’t a particularly sustainable way of life over the long haul. I do touch briefly on the horror in Station Eleven, but I feel that that territory of post-apocalyptic horror has been very thoroughly covered by other writers, and I wasn’t interested in spending too much time there. For me, it was more interesting to write about what comes next, which is why the post-apocalyptic sections are set twenty years after the collapse. After the initial nightmare of societal collapse, what does the world look like twenty years down the line, when a new culture has begun to emerge? That was what I found myself most interested in writing about. The conversations between the performers about which surviving works matter — which are evocative, which need preserving, which do audiences enjoy — are among the strongest passages in the book. Kirsten collects gossip magazine clippings and pages from a comic, Station Eleven, that closely mirrors society’s present predicament — a manmade planet where it’s nearly always dark or twilight is divided by straggling citizens who either wish to stay or return to their overtaken home. Although the comic was a vanity project created by another character who dies during the pandemic, it resonates with survivors more than any other story seems to. "I've long been interested in memory as a topic," writes Mandel. "I'm interested in its unreliability ... and in the possibility of memory becoming a burden ... that in a post-apocalyptic scenario, the more you remember, the more you've lost" (Tethered by Letters). To help remind us of the world they lost, the narrative offers flashbacks to the interconnected lives of Arthur and his three wives (Miranda, Elizabeth, and Lydia); Arthur's friend, Clark; Elizabeth and Arthur's son, Tyler; and Jeevan, the paparazzo turned entertainment journalist who gets the exclusive that Arthur is leaving his second wife and son to be with his soon-to-be third wife. Jeevan was also in the audience of the play in which Arthur died, the first night of the pandemic. Mandel had to make a map of the book in Excel to keep track of the multiple storylines, both past and present. "I was constantly reordering the book and moving chapters around" (BookPage). The AV Club: " it’s “another” piece of post-apocalyptic fiction, but it’s a particularly beautiful one," "once you surrender to the terror in Station Eleven, there’s real human warmth in the collapse of civilization." The pieces of the book I found most moving were the ones Mandel talks about in this interview: I wanted to write a love letter to the world we find ourselves in. It's a world where — you got here by subway, and it's a fast train underground, and we have electric lights, and water comes out of the tap, and we have access to antibiotics. And these are things we totally take for granted! So many things left unexplained, or left undone. The shadows of the civilization ended. Traces of the world left behind, useless: refrigerators. iPhones. Spices. And what was needed: horsehair for bows. Soap. Boots. I found this to be a hauntingly beautiful novel. And filled with evocative images. Jeevan's trash-tent. The idea of a family, frantic with a feverish infant in the snow at the airport sign. The ghost jet. Survivors at the airport learning languages to pass the time between survival. Eating deer because of course their population would have exploded. Our world is a magical, fragile place. I liked this book a lot. I've got a fairly extensive, if amateur, performing background, and I like to think that if that kind of world-ending pandemic happened for real, I'd join up with (or form) a wandering troupe. In reality, though, I suspect I'm one of life's NPCs, and I'd probably wind up dying of the flu in a Stephen King's The Stand-esque two-or-three-paragraph vignette. Me too, Mr Bad E. I don’t really have what it takes to survive anything remotely hard-though I often make elaborate survival plans while trying to fall asleep. The line I always remember is about the man I’m the airport eating an orange, not knowing it was his last one ever. I read this book around the same time that I watched Mr. Burns, a Post-Electric Play, and thought they made very neat companion pieces. I enjoyed the pieces of this book, but ultimately I felt that Tyler's story and Jeevan's story didn't really fit. I'm about 3/4 of the way into it. I was skeptical at first, but ending up really like the book! At first I wasn't into the flashbacks but they ended up being cohesive and tells a very well rounded story about connections and missed connections. Very much did not mind the vagueness and 'letting the reader infer the background' approach. The author has more optimistic ideas of human nature than I do, though. It's not "hard scifi post apocafiction" but believable enough, for example gasoline going off after a couple of years whereas jet fuel is a little more stable. The most difficult to believe parts (surviving the first year) is mostly glossed over and taken for granted. Which is fine. I enjoyed this book. I don’t remember the details but I do remember reading the last half while stuck in LaGuardia trying to get to Toronto which felt appropriate at the time. This was one of the most hotly-debated books in my book club. I recall one of the members, an engineer, had a hard time identifying with the main characters in the post-apocalyptic timeline because they were performing Shakespeare instead of trying to get the lights on. But hey, you gotta have your circuses in addition to your bread. I really liked Station Eleven and attended a talk given by the author. I was surprised to find out she has never worked in sci-fi or post-apoc genre before this. It's been a year since I read it and going by memory, one thing that stood out to me was the comic book within the book that kind of parallels the story. It reminded me of the pirate comic in Watchmen. I just tore through this in three days. This is the version of The Stand that I had been looking for all these years! I attended a lecture by her last year (count me in the fan club, a lot of librarians/archivists are straight-up obsessed with this book) and it really made a deep impact on me. I'm not sure if it's OK to self-link in FanFare, so if anyone wants to read further I'd be glad to send the link to my blog post about the lecture via messages.